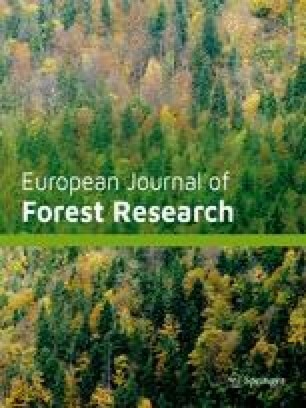 Height after 15 years, bud burst and mortality varied significantly among 13 southern Italian (Calabrian), a central Italian, a German (Schwarzwald), a Romanian (Carpathian), and a Danish provenance of silver fir (Abies alba Mill.) tested in two field trials in Denmark. The variation in height was especially observed in the field trial that was well protected against late frost in the spring and early frost in the fall by a shelter wood of larch. Provenances from the region of Serra San Bruno (Calabria) and two provenances from the region of Gariglione (Calabria) showed superior height growth at this site compared with the remaining provenances. Height was below average for two provenances from the region of Aspromonte (Calabria). The variation in height correlated significantly with biomasses of the same provenances obtained in early tests. Bud burst was earlier among provenances from the regions of Serra San Bruno and Aspromonte. These were also characterised by poor winter-frost resistance in early tests. The Romanian provenance was not represented in the shelter wood trial. The variation in height between provenances in the other field trial was mainly due to the Romanian and the Danish provenance with superior and poorer growth respectively. Otherwise, differences between the remaining provenances were not significant at this site probably due to the influence of frost. Provenances with poor winter-frost resistance had higher mortality at this site.